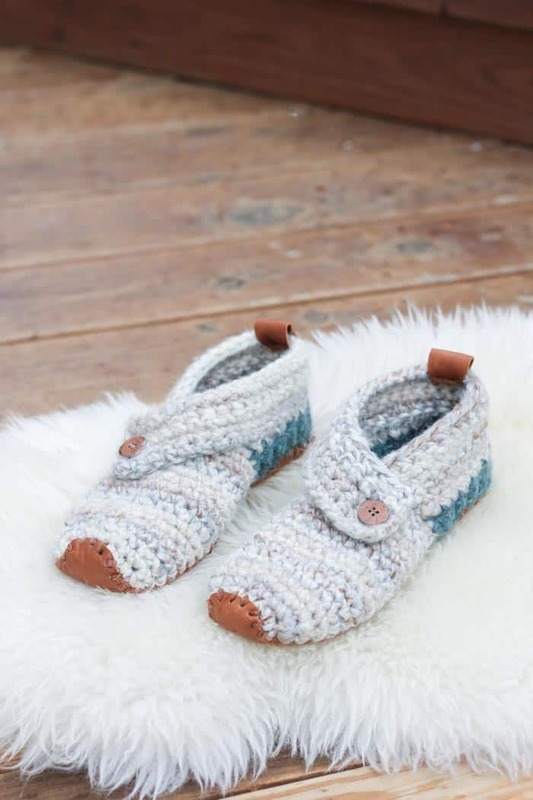 This free crochet slippers pattern will satisfy the modern minimalist in you while also making you feel like a gift giving hero. They make the perfect gift for teachers, new moms, a friend who is sick and anyone else you want to wrap up in a little bit of love. The free pattern is below or you can purchase the ad-free, printable PDF for $2.75 here. Tell me if you’ve ever been here. There’s someone you really appreciate–a friend, your kid’s teacher, your grown son who calls you from college every Sunday–and you think, gosh, I love to crochet, I wish I could make something for so-and-so that would just show them how much I adore them. So you brainstorm. A sweater? Too involved and it may not fit anyhow. An afghan? It might take three years to finish. A cup koozie? Sure, they’re cute, but no one needs another piece of clutter in their kitchen. And so, in a mess of love and indecision, you don’t make a darn thing. I really hope this project will change that. 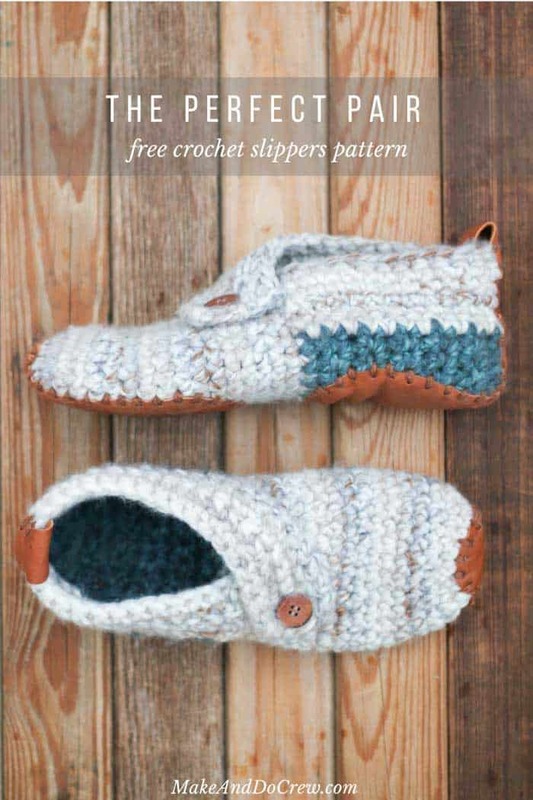 This free crochet slippers pattern combines just enough cool factor and genuine functionality that you can give a pair to almost anyone and know that your gift will be enjoyed. 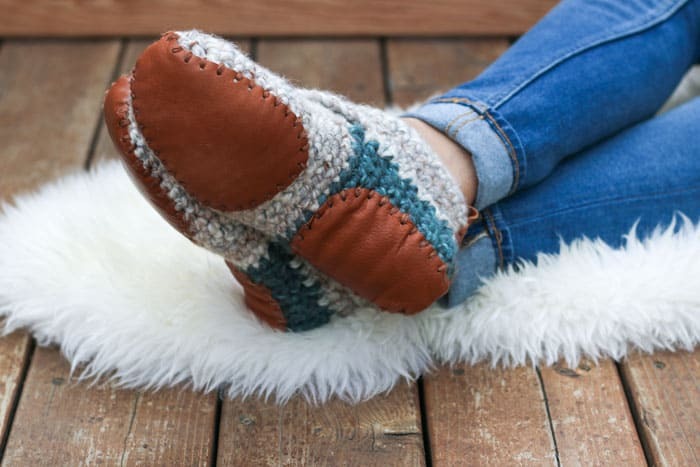 The minimalist style can be appreciated by feet young and old and the chunky yarn and leather soles make these house shoes look pretty fancy schmancy. While the leather soles on these slippers are optional, they really help with the grippy-ness on hardwood floors. 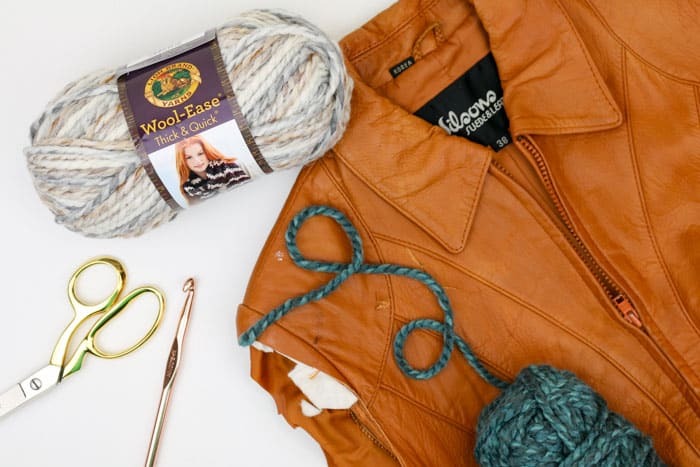 Not to mention, I just love the look of leather and yarn together! For this project, I cut my leather soles from a thrifted leather jacket and I’ve still got plenty of leather left for future projects. If you decide to use thrifted leather, look for the thickest you can find–a purse or coat could work great. Because I really want you to be able to crank out these slippers as easily as possible, I put together a printable template for cutting the leather soles and added it to the Make & Do Crew exclusive subscriber Vault. Just enter your email address in the box below the pattern and you’ll receive an email with download instructions! 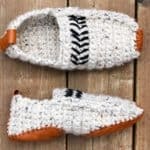 Thanks to my creative crush and fellow crochet blogger, Sarah from Repeat Crafter Me, for posting an adorable pair of men’s slipper socks recently that helped show me how a slipper could be constructed in an easy-to-follow way. 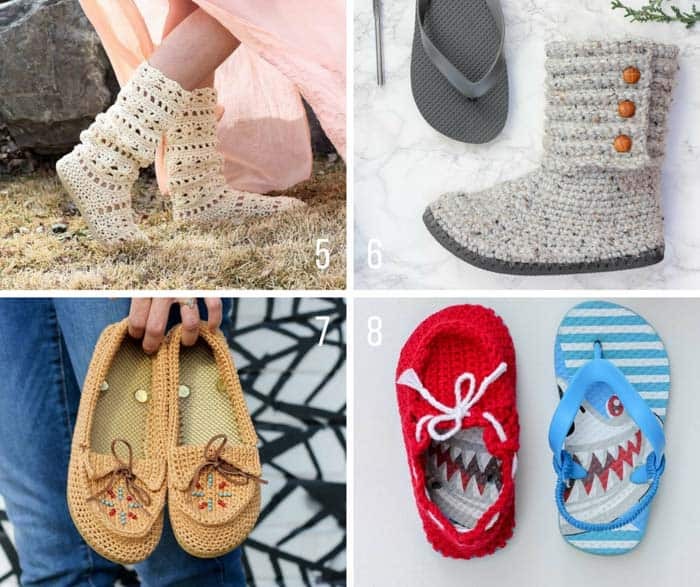 Until seeing Sarah’s pattern, I just didn’t know where to start with a slipper pattern, which might seem funny given how many crochet shoes I create. Sarah is a genius at simplifying designs to their most basic elements and I think her skills shine best in her free corner to corner crochet patterns. So charming, aren’t they!? 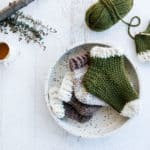 This free crochet slippers pattern will satisfy the modern minimalist in you while also making you feel like a gift giving hero. They’re speedy to work up in chunky yarn and require only basic crochet skills including working in the round, single crochet, and slip stitches. Make a pair for yourself and then outfit the feet of every other cool lady in your life. These are a perfect gift for teachers, new moms, a friend who is sick and anyone else you want to wrap up in a little bit of love. These slippers can be easily made to accommodate a bigger shoe size by working additional rows of the heel section. 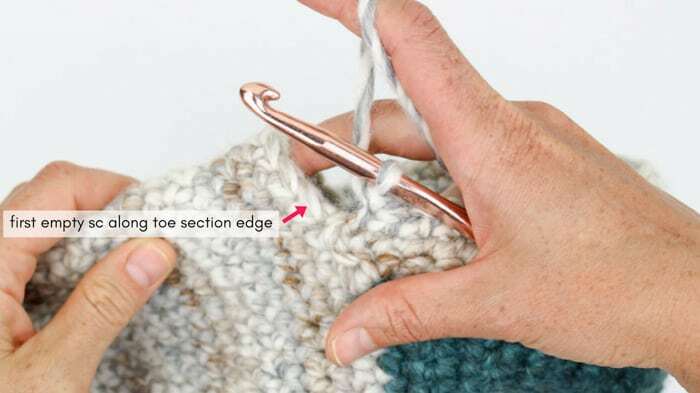 • Stitches are intended to be worked tightly and you may choose to reduce your hook size to make it easier to crochet the gauge. If in doubt, please make a quick gauge swatch. A pair of size 9/10 slippers use a full skein of Color A. • The toe section is worked first in the round. Next, the heel is worked in rows. The final ankle band with button hole is added last. • Right and left slippers are worked identically until the ankle section. • The toe is worked in the round. Slip stitch to the first stitch of the round to join each round. Do not work into the slip stitch from the previous round when you come back around to it. Rep Round 4 10 (11, 11) times. Fasten off. Cinch magic circle and weave in all ends. • This section is worked back and forth in rows between markers. Row 1 is worked into the last round of toe section. Place stitch markers with 11 stitches between them. Be sure to orient minor sl st “seam” from joining rounds on the toe toward the bottom of slipper so it’s hidden later. Attach Color B in marked stitch on right-hand side of slipper (assuming toe is oriented away from you). 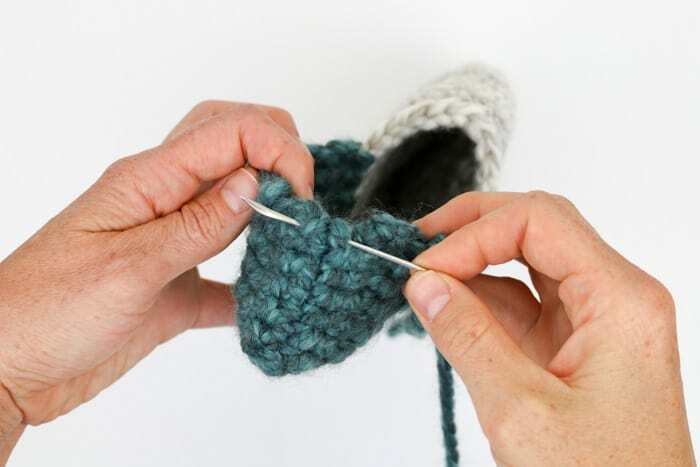 Left-handed crocheters, attach yarn in the marked stitch on left side and reverse mentions of left and right. Be careful not to accidentally work into the sl st from the previous round when working Row 1. Rep Row 2 10 (11, 13) times. Using a tapestry needle and the tail from toe section, seam back of heel using the mattress stitch. Fasten off and weave in any remaining ends. • This section is worked back and forth in rows, with separate instructions for the right and left slipper. • Left-handed crocheters, reverse mentions of left and right. Row 1 (RS): Ch 1, sc along heel edge placing 1 sc per row of sc in the heel section; when heel edge ends ch 10 (11, 11); turn. Row 2 (WS): Ch 1, sk first ch, sc in each ch, sc in each sc around heel to end of row, sl st to first empty Color A sc stitch along toe edge, sl st into next sc along toe section edge; turn. Row 3 (RS): Ch 1, sk 2 sl sts, sc in each sc; turn. Row 5 (RS): Ch 1, sk 2 sl sts, sc in each st including the ch-1 buttonhole sp; turn. Row 6 (WS): Ch 1, sc in first sc, sc2tog over next 2-sc, sc in each of next 2-sc, sc2tog over next 2-sc, sc in each sc to end of row, sl st to first empty Color A sc stitch along toe edge. Row 1 (WS): Ch 1, sc along heel edge placing 1 sc per row of sc in the heel section; when heel edge ends ch 10 (11, 11); turn. Row 2 (RS): Ch 1, sk first ch, sc in each ch, sc in each sc around heel to end of row, sl st to first empty Color A sc stitch along toe edge, sl st into next sc along toe section edge; turn. Row 3 (WS): Ch 1, sk 2 sl sts, sc in each sc; turn. Row 5 (WS): Ch 1, sk 2 sl sts, sc in each st including the ch-1 buttonhole sp; turn. Row 6 (RS): Ch 1, sc in first sc, sc2tog over next 2-sc, sc in each of next 2-sc, sc2tog over next 2-sc, sc in each sc to end of row, sl st to first empty Color A sc stitch along toe edge. With a sewing needle and thread, sew a button to each slipper in the position where the ankle cuff strap meets the toe section. With a tapestry needle and a doubled over piece of yarn that matches your leather, sew soles to slipper bottoms using a whip stitch. (See Photo E) I’ve found that even the strongest yarn can wear out pretty quickly when used to secure slipper soles, so you can choose to use a doubled over piece of monofilament (fishing line) instead or in addition. Put the kettle on, grab a magazine and settle in for a cozy Sunday afternoon at home. Love your pattern. Ladies want to buy the slippers. How much should I sell them for.? I love the look of these slippers. I never thought of cutting up an old leather jacket or purse to make the sole pads. You are so clever! Thank you. I love your patterns!! So creative!! Two questions; Do you have a video for this new and fabulous pattern? And Do you have A cool crochet pattern for boys/ men’s slippers? I’ll actually be releasing a men’s version of these slippers next week. Stay tuned for the free pattern! PLEASE make a video tutorial. At least for the people who get the pattern. That would be so perfect. Thanks for the feedback. I’m glad to know you’d be interested in a video tutorial! I would also LOVE if you could make a video! I’m only just getting back into crocheting and while learning how to properly read a pattern is on my to-do list, I do so much better with video! I’m so in love with this design, I can’t wait to try! I’m so happy to hear that, Suzanne! These slippers are awesome! I am just starting my Christmas projects and will be making several pairs of these. I am surprised, though, that you didn’t put them on a flip-flop sole. Maybe later? Thank you for your generosity. Some people just don’t want to try the flip flop thing though, so this is one that everyone can make! I’m so impressed you’ve gotten your Christmas gift list started. I need to do that too! I love your patterns. I am allergic to wool though. What would be a yarn that would work that isn’t wool? I love them all hope one of these days I can show what I have done. I would love that too, Montel! I would like so much to be able to make these and have them functional. Have tried so many slipper patterns, to no avail. These might be tricky for me, if the stitch needs to be tight, as I crochet pretty loosely. Tried a bulky yarn which called for aligning 2 pieces of yarn crocheted together; could not get this pattern to work and gave it up. It is now one of my many WIPs. It a lovely slipper, thanks for the pattern. Beautiful slippers. These are DEFINITELY on my to-do list. I’ve tried many slipper patterns the last little while, even have a another pattern with a leather sole sewn on. And that’s where I failed. The leather sole didn’t really cut it. Can you please tell me how I can download the template for the sole, please. I don’t seem to have a password for the vault, even though I am a subscriber to your emails/blog. Thanks for much for all your fun patterns and tutorials! I could not get the template. I tried several times. I even re-subscribed to make sure I had it right, even did the copy and paste. Nothing worked. Did you get into the Vault? The template is at the very top of the exclusive resources page. I just checked and it’s working fine for me. Perhaps when you copied and pasted, there was a space included at the end of the password? Feel free to send me an email if you need more help! jess (at) make and do crew (dot) com. Do you make and sell these by chance!? I would love to get a pair from you! It sometimes end up in junk/spam folders, so check there if you don’t see it right away. I’m so happy to hear that. Thanks, Lori! Love the look of these slippers, but would love to see a video. It would be so helpful! Thanks for letting me know you’d like to see a video! Hi, I’m Sandra.I am brazilian . I really liked the slippers.Very nice. Hello from Colorado, USA! Thanks so much, Sandra! A video tutorial for these terrific slippers would be absolutely awesome!!! I would LOVE to make a pair of these, Jess! It’s perfect since we have leather left-over from our Star Stitch Purse leather handles too! I love the shape and style of them- your designs are always so modern! Thanks so much, Stephanie. I’d LOVE to make your Star Stitch Purse. You and Ryan really made some awesome handles for it. They’re just the perfect accent for the beautifully textured stitches! Yay! I love starting new projects! Thanks for a cute slipper pattern! I love it and already made one pair but the hook/gauge seems to be incorrectly stated. I do not crochet loose, but had to use a K hook to make the size 7/8 with the recommended Lion Brand yarn! Even then, they turned out a little large. You might want to double check your recommended hook/gauge. I too am having the same problem and even with a K hook, I’m still not matching the gauge sample. I had to use a J10 (6.0 mm) hook to get the right gauge! I am not a loose crocheter either. It seems important for this pattern to make a gauge swatch. I am surprised to see the pattern calls for such a large hook (even bigger than what the yarn calls for) and Jess was able to make it so tight! I will report back after I finish to see how the size fits! Beautiful pattern! Well, as much as I really wanted these slippers to work, they were just too large, even with a 6.0 hook😥. I got as far as the ankle cuff and kept trying them on, but they were too loose. I ripped them out and may use the yarn for a basket. Maybe a smaller hook would work for a size 7/8, but I’m not sure the super bulky yarn would like a much smaller hook. Yours look so dainty compared to what I ended up with! Oh boo! I’m sorry to hear that, Vanessa. The stitches def have to be worked tighter than you’d usually do with this type of yarn, but you’re right, that’s what makes them have a nice cozy weave. When I was making mine, I would keep my working yarn pretty tight as it would prevent the loops on my hook from getting too large. Does that make sense? Hi Jess, I tried the recommended yarn size 6/bulky, with size N hook. By the time I got to 10 rounds on the toe it looked like they would fit a giant. Alternate yarn size 5 with a K hook works perfectly. I guess my question is why the recommended yarn and hook worked up so big? Please please please make a video! I’m so in love with these slippers but as a beginner, really need a video to even make the attempt. Thanks for letting me know, Lauren! I’d love for more beginners to be able to try this pattern. I am also a beginner. I’m hoping this pattern isn’t too ambitious but I LOVE them so much i have to try. Going to a thrift store soon in search of leather. A video would seal the deal on this project for me. thank you!! I was so excited to find these this morning, as there is one person I wanted to make a Christmas gift for but had no idea what to make. These are perfect! And I always seem to have a problem with crocheting too tight, so this is double perfect! 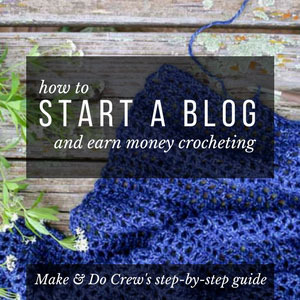 I have only been crocheting for a few months and everything I have crocheted so far had a video tutorial, but this pattern is so clear and easy to understand, that I think I could make these by following the pattern. Although I would love if you made a video tutorial! Having trouble with the cuff portion of the pattern. I would love a tutorial on it (the buttonhole in particular). These will make great Christmas gifts. I can’t believe it is getting to that time already. Now how to overtly ask for people’s sizes? haha. Am I actually chaining 10..that doesn’t seem correct…I don’t believe its just 10 sc total on heel edge ..and it doesn’t seem like 10 rows either. There are no comments regarding this so my brain must just be in a glitch . Could you please clarify for me..I love this pattern thus far! I did figure it out after I put it down for a bit and came back to it. I was so excited, I was blocking my own progress. I have now made 2 of your crochet slippers with flip flops, and on my second pair of this pattern. I am on to the UGG boots next. I love them all, thank you! I have made some modifications, with notes, as my foot size is more a size 3.5 – 4. Can I send you the notes for anyone who may be looking for a smaller version? That would be fantastic! Feel free to email them to me at jess (at) makeanddocrew (dot) com. I’m so happy to hear they’ve been fun and useful to you! I am a complete beginner and am attempting this pattern, but am a bit confused: don’t work the ankle part directly into the toe section? Is that where the stitch markers come in? Thank you so much for your help, I’m just having a bit of a hard time visualizing this since it’s like my theirs crochet project (the first was the Suzette bag, the second was a scarf). Thank you for such a great pattern. I just finished my first pair and I know that I am going to love them. I did end up doing the right foot twice because the first time wasn’t tight enough, but I figured it out with the left foot and along with a simple adjustment to fit my small ankle and they are perfect. I used the K hook and as long I crocheted very tightly they turned out correctly. I’m just getting ready to cut the leather and I have a question about the instructions for this part.. The sentence that states, “Do not punch holes in the top section of leather than will be at the top of the slipper ankle” doesn’t make sense to me. Could you please explain further? I’m glad you got the tension settled! I often find myself remaking my first shoe/slipper once I know a little more about how the yarn and hook will work together. That note about the leather simply means to be cautious not to poke your holes all the way up to the very top of that leather piece. The reason is because you’ll want to fold it over the top of the slipper, leaving a little tab, and you probably won’t want to have holes in the tab. If you just poke holes sort of how the template shows, you can always add extra holes once you get the leather on your slipper and see where else you want to add stitches. Hope that makes sense! Jess, please help. I have crocheted part of the slipper, to the point of joining the heel, but now I am struck. I am confused as to what to do next. It says on the right side and sc into each row. Please help. 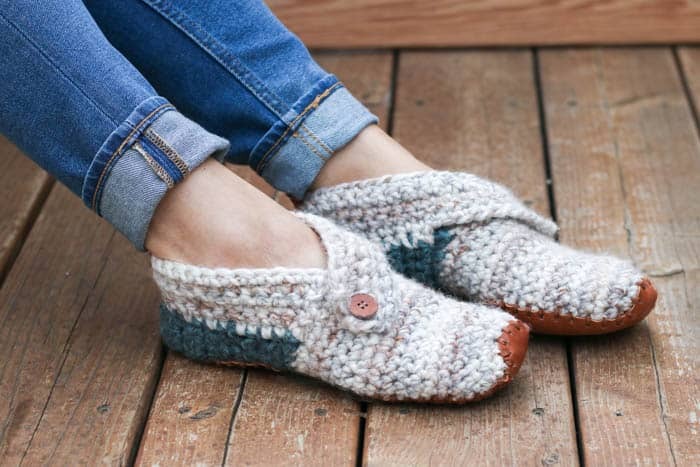 Love these … I saw these first on Ravelry and have almost completed the first pair but would like to know where to attach Color A on the left slipper so it’s the opposite of the right slipper. Without a picture, the only thing I can think of is to attach it from the inside on the left. I agree with several others here that a video would be helpful. YOU should check this out. This woman stole your pattern. and then went on a bunch of FB groups and posted a CAL to try and get ppl to buy her pattern. I just felt it was wrong and wanted you to know. I’m just wondering about the hook size. I’m not sure if I missed something, It’s different on here than in the pdf pattern. Can you please confirm what size I need to use? Love these slippers!!! I hope to make a couple (at least) pairs for Christmas gifts. I have to make a run to pick up the yarn otherwise I would have started already.. can’t wait.. I would also like to put in my vote for a tutorial. I’m not a beginner exactly but get easily confused ( senior moments) and always find tutorials are so much easier for me to follow. Thank you so much for sharing your talent with all of us! I wear a size 12/13 women’s. Is there a way I can modify your patterns to fit me. I’ve never crocheted clothing before and really want to make all your footwear patterns. Yes, these would be quite easy to modify, I think. I’d just work additional rounds in the mid section of the foot until your piece is hitting you mid-arch. If you find that after you do all the increasing rounds, it’s still a little tight, just do one-two more increase rounds to get the right circumference around your foot. I would also like to see a video, I’m from the UK and following a US terms pattern can be confusing, I have found videos to be really helpful! Lovely slippers though, I would like to make some as gifts this Christmas, with an 11 week only baby homemade gifts are the way to go this year! Do you remember, by chance, where you got your buttons? I’ve been to three stores but can’t find buttons that match my leather well like yours do! I think I’m maybe a little too picky about buttons! Haha, I can understand that pickiness. Man, I wish I could remember. I think it may been Joann’s. But I’m not certain enough to tell you to jump in your car and go there. I’m sorry I don’t have more info. They’ve been in my stash a long time! Love them. I am almost done with first pair for me. Next I will make a pair for my daughterand then my son. Thank you so much for sharing the pattern. Blessings!!!! Love you patterns. What do I get for not making a gauge swatch, a super set of slippers for my daughter. I didn’t realize I was that tight of a crocheter. Oh well, this is a great pattern, thanks for all your work! Hello! I love the look of these slippers and am trying to make some as a gift for a friend who wears size 9. I made the gauge swatch and it came out perfectly. I have the toe section done for both, with all 16 rounds, and they seem a little short. When I try them on, they stop in the middle of my arch, and I wear size 8.5. 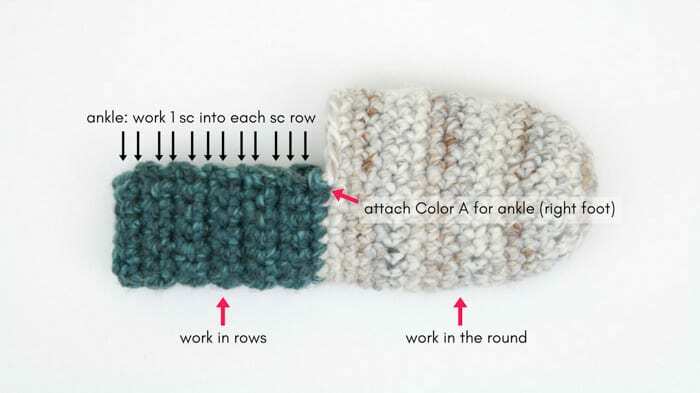 I noticed in the photos in the pattern, those slippers seem to have 18 rows in the toe section, so I am wondering if I’m doing something wrong, if if should add a couple rows, or what you suggest? Thanks in advance for your help! Thank you so very much! I appreciate the advice and the timely response! I’m also making your Sierra boot slippers for the same friend, so I’ll let you know how they turn out! Have an awesome new year! Hello again! I’m wondering if you could tell me how long your finished slippers are from toe to heel? Now that I have them finished, they look like boats to me and I’m second guessing adding the additional rows and thinking I should have just followed your pattern as written. Thank you! I LOVE these slippers. The 1st one I made could’ve fit a horse. So, I went down a hook size and made it as tight as I could (hands hurt the next day). I wear a 7/8, but the smaller size fit better. Everything was great until I wore them a few hrs. Now they’re way too big. They stretched so much. I couldn’t get my hands on the suggested yarn & was too excited about this pattern to wait, so I used Yarn Bee Effortless. It’s the same #6 super bulky as the suggested yarn, but contents are different. Contents: 76% Acrylic, 20% Alpaca & 4% Rayon. If I remake in the suggested yarn…will they stretch out as much? Hmm. I’m surprised to hear they stretched out that much since you crocheted so tightly. My experience has been that they stretch a bit with wearing, but not so much that I’d think they were unwearable. Do you think washing them might put some structure back into them? I’m not really sure? The yarn you used does not have a super different fiber content, but all I can think is that is has a bit less structure than the yarn I used? I’m ordering the suggested yarn today and giving it another go. Everyone in my family is begging for a pair. 21 yr old son included. They are absolutely the most eye catching thing I’ve ever made! I’ll update you on the difference. I obviously won’t be walking outside in the rain and snow in these bit I suppose they do become dirty at some point. How would you clean them if you have added the leather soles? I saw on another makers crochet slipper pattern to use hemp twine to sew the leather bottoms on to have better longevity against wear, so I thought I might suggest it. Oh yeah, that is actually a fantastic idea! Thanks for sharing it, Lindsay! Love these slippers and I’m halfway done but I seem to be stuck on the ankle cuff- shouldn’t the sc go all the way around the back of the heel- a total of 24,stitches vs. Only 12 ???? Hi Jess! I started following you after finding your Suzette Stitch Bag. I have made 3 and given them waay as gifts. Love the pattern and look! Now, I have tried making these slippers (which are awesome looking) but can’t seem to get past row 4 of the ankle. Just wondering if you are still considering making a video? I’m so happy you enjoyed that bag pattern! Yes, I have a video planned for the next couple of months. I’m sure you don’t want to wait that long though. Can I try to help you in the meantime? Adding my vote for a video tutorial pleeeease! I don’t think I’m working the pattern correctly and this bulky yarn is making it trickier. Visuals are such a help! Hello from London, I absolutely love this slipper pattern and have just found the perfect leather jacket from a thrift store, yarn on order and ready to start this project. I just wondered what your advice would be on how I should wash the finished slippers in the future considering they will have leather soles stitched on? Glad you found all the perfect supplies!! Thank you so much Jess, I’ll give that a try. The pattern here quotes a size K (6.5mm) crochet hook but the .pdf pattern calls for a size N (10mm) crochet hook. I’m assuming the size K hook is the correct one and the size N hook is a typo; is that true? Can’t wait to try this pattern out! could you please send the download for the leather soles? I like the pattern. I need this. Pleace send me the pattern of the lather sole. Hi jess what a beautiful pattern I have just finished one pair but not Shute how to cut the leather soles for them could you please help love them so much .